Nicole Richie is known for her fashion, her legendary oversized shades and bohemian style she is a Fashion Icon. You to can take some inspiration from Nicole Richie's style or even recreate her look with the bible aka. 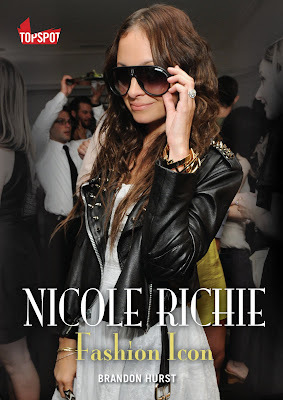 The Book Nicole Richie : A Fashion Icon by Brandon Hurst. Nicole Richie : A Fashion Icon, a new 200 page book follows Nicole Richie's evolving style to date and documents her signature looks with 90 pages of colour images of the fashionista herself. The publishers of Nicole Richie : A Fashion Icon A-Jot are giving you the readers of NRichieNews an exclusive chance to have an input on the book's look! They have designed two different covers for the book and your views matter. Take a look at the two covers and vote on your favourite. Nicole Richie: Fashion Icon is due to be released mid February 2011 and will be available at all good book stores and also online. Check back here soon for more news and an exclusive NRichieNews discount code for the book Nicole Richie : Fashion Icon. Cess, I agree with you, I love her outfit on A!! I voted for A as I like A's show of Nicole's clothes and B doesn't look professional. I don't like Nicole's hair in A though. both look non-official and bad! :( I hope they go with something from a photo shoot, like The Truth About Diamonds!